Conceived and retained by Pdicta Corp. This patent reflects years of study of a highly cost effective way to track parametric characteristics of racing sailboats. The applicability is wider, however, to cost effective tracking of any asset where the desire is to know where the asset has been, rather than where it is. 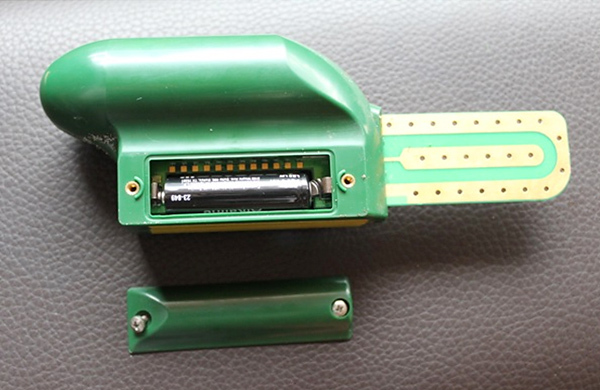 The client approached us with a novel moisture sensing mechanism that required part of the PCB to be exposed to soil. They needed a product design that could withstand years of buried operation in a wide range of temperatures, moistures and soil compositions. The circuit needed to operate from 2 AA alkaline batteries, and needed to communicate a great distance by RF. The dielectric properties of surrounding soil, particularly when moist, was a difficult challenge. This design proved to be aesthetic and unique in appearance, while being very practical. The batteries sit low in the case to keep center of gravity low, a door enables easy access to the batteries and test circuits, and the large ‘top’ enables a substantial air gap to simplify antenna tuning and improve performance. 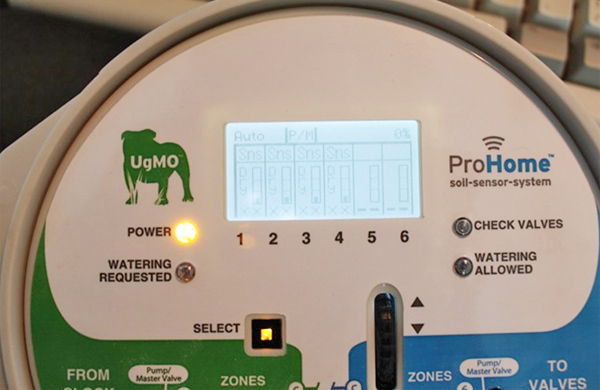 Coupled to the Wireless Soil Sensor aesthetically and by radio link, the Interrupter controls watering based on soil moisture readings received from Sensors. The client asked that the Interrupter have a unique shape which could be readily identified from a distance. The round shape of the Interrupter sets it apart, already, but on opening the front door the wiring compartment contained within a distinctive ‘smile’-shaped cover. The second Design patent of the two was for the User interface. Using an optical encoder with a vertical rubber wheel, a single lighted button and a small bitmapped display, this interface accomplished a lot with an intuitive interface. Static images don’t do it justice. Method and System for Soil and Water Resources. This utility patent covers the mechanism we invented for the Interrupter to manage watering once we had inputs from the sensors. This invention has outperformed all competitors (most of whom use one or two soil sensors, instead of an array of them, and rely on complex information about soil type, weather patterns, shading, wind speed, weather forecasts and the like). Our method worked from a 1..10 scale requiring no expertise beyond noticing whether the grass was too dry. It adjusted itself for weather, seasons, soil types, plant types – without external inputs. Fantastic. We’re proud of this one. These three utility patents address the challenges of communicating from fully buried sensors to above ground controllers. Extending range to the maximum possible distance is crucial for simplifying installations. The sensors measure soil moisture by measuring the dielectric contestant of the soil (see the reference patents) which vary heavily and predictably with moisture. This same high and variable dielectric constant is one of the primary challenges to radio communications from buried sensors. These patents reflect ways to take advantage of the knowledge of the dielectric to optimize the tuning and power levels of the communications power amplifier, or conversely, a way to infer changes in dielectric caused by changes in communications. In 1994, Sony Electronics launched the MagicLink Personal Communicator. This large PDA included an integral modem for communications. Our principal, Clayton R. Karmel, was hired as Network Products Development Manager to extend the capabilities of the MagicLink to support a wide variety of communications options, including one-way paging, two-way paging, circuit switched cellular, digital cellular (US), digital cellular (GSM), CDPD, and Ricochet. For those who worked in the 90’s on wireless data, that list is a blast from the past. The problem was that the configuration settings for each of these systems depending on the system being used and on the user’s location. In response, we developed a ‘place’ metaphor for the communications method, and detected the insertion of a modem card or phone cord, by which the system could then interpret the appropriate settings. The Magic Link failed commercially, but gave rise to the Sony Cosm Communicator, launched in Feb 1998 at the CTIA show in Atlanta. The Cosm was arguably the first color screen phone and first camera phone, prompting the following three patents, two about information display and one about circuitry. Unlike modern smart phones, the Cosm Communicator didn’t use a touchscreen. For pragmatic reasons as well as aesthetic, Cosm was navigated with a “3D-Jog Dial”, a button normally manipulated by the user’s left thumb. (It sounds bizarre, but felt completely natural to test users.) At the time, displays were already thick, and touchscreens would have added both thickness and parallax, too. But entering text by navigating a keyboard with a pointer was a non-starter. Instead, we invented an on-screen ‘text entry wheel’, which allowed just up and down movements to spin around the wheel. Very fast. And no training required. As phones did more, they required ever larger power supplies. Running the phone and charging the battery each took substantial loads, sometimes more than was available from the charger. This invention was a new way to split the current between the two uses. Now usually called ‘Power Path’, this problem is common for USB chargers. Our principal, Clayton R. Karmel, had worked on GPS systems and circuits previously. At the time, a number of differential GPS solutions were available and solutions to provide ‘reliability’ for GPS receivers were being considered to allow its use in aviation. The invention was a novel method for developing improved accuracy and reliability when packet radio (now often called wireless data) communications were available. This invention was made during the period of work on various wireless data/packet radio for the Magic Link, although the implications were much more broad. GPS works by a receiver capturing signals from multiple satellites, using those signals to measure elapsed time since transmission, calculating distance, and to receive ephemeris data in order to know where the satellites were at the time of transmission. Having 4 or more measurements, the receiver can solve for 4 variables, X, Y, Z and time (or Latitude, Longitude, Altitude and time). A packet data connection could provide the ephemeris data much faster, as well as corrections including compensation for atmospheric effects or errors in the ephemeris or corrections for intentional degradation (Selective Availability) injected by the US Government. The invention included receiving information about the position of the user, as well as position assistance. These patents have been BROADLY referenced since the 1997 filing and 2002 grant, including by Qualcomm, Apple, IBM, Siemens, NEC, Panasonic, Sharp, Nokia and others.